The last of the Vauxhall T Series models, the expensive Silent Eighty, had proven to be a car out of its time. In design & style it was a throwback from the boom times of the 1920s, it was very large, expensive to buy & run, lavishly equipped and mechanically quite sophisticated – in other words completely the wrong car for Britain in the early 1930s which was just recovering from the worst depression in economic history. The Vauxhall Cadet had moved the Company into a lower priced sector of the market but was still not a huge sales success, it too was battling against the same economic headwinds as the Silent Eighty and was priced just outside of what the average motor car buyer could afford. Vauxhall were already working on a new smaller car to enter the increasingly popular 12hp/14hp market with The Light Six but this would not be a replacement for either the Cadet or the T Series, it was far too small for that. 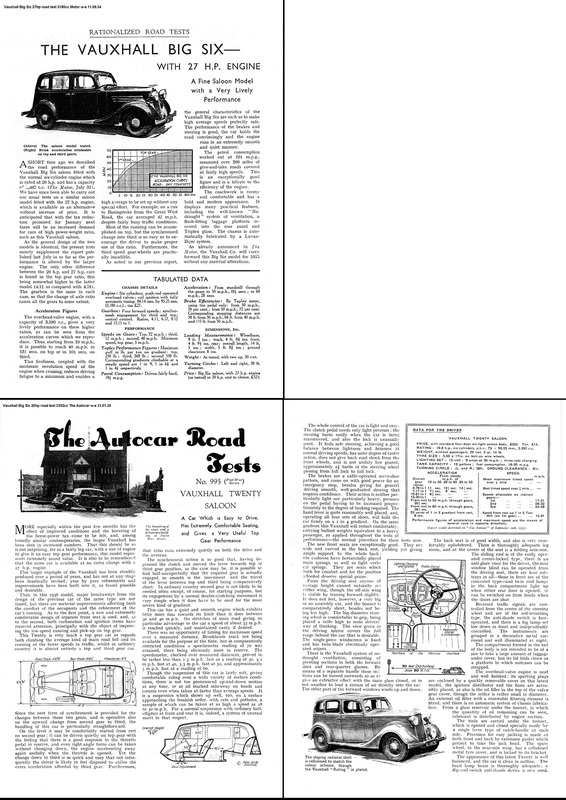 With GM President Alfred P Sloan’s mantra that “the British car buyer would purchase a larger, more powerful car if it was offered at the right price” Vauxhall management succeeded in an international corporate trade off; they would get the car they knew they needed and Senior General Motors Executives would get the car they thought Vauxhall needed. The new car would be a direct replacement for the Vauxhall Cadet but with a long wheelbase version that would also cover the T Eighty market in size but not necessarily price. In an effort to reduce development costs, and enable as lower selling price as possible, many existing mechanical components would be used but clothed in completely new bodywork of more modern design. To fully develop two new & unrelated models in such a short time-frame have would stretched Vauxhalls relatively small Engineering & Styling Departments and so, as a temporary measure, extra engineering staff were drafted in from GM in Detroit to assist – these were primarily associated with the new large car. As the new Light Six was coded as “A” the new large car was correspondingly coded “B” and for the same reasons the name Big Six was adopted. Engineering for the Big Six was competent but conventional. The export versions of the Vauxhall Cadet offered a choice of two engines, the 2048cc 6-cylinder OHV with an RAC rating of 17hp that was also the only engine available for the domestic market versions and a 3180cc OHV 6-cylinder engine with an RAC rating of 26hp that was only available in export markets. It was this larger engine design that was carried over to the new Big Six, with an RAC rating rounded up to 27hp, but included a revised cylinder head with near hemispherical combustion chambers which greatly improved the engines efficiency and power output. To offer customers a choice of engines and therefore economy & performance, whilst keeping production costs in check, an RAC rated 20hp engine was developed by retaining the 95.25mm stroke but reducing the bore to 73mm which gave an engine size of 2392cc and produced 52bhp@3900rpm, both Big Six engines used a slightly higher compression ratio of 5.6:1 compared to 5.5:1 before. A four-speed gearbox with synchromesh on 3rd & 4th and helical cut gears giving a “silent” third was a modified & upgraded unit fitted to the Silent Eighty with revised internal ratios and the addition of synchro rings, this gearbox design would also be fitted to The Light Six. Chassis layout & construction for The Big Six was a heavily modified version of the Vauxhall Cadet which used the same 56.5ins front track, a 1ins wider rear track and a wheelbase increased from 107ins to 111ins for the standard cars and a further stretch to 130ins for the long wheelbase versions. Although the engine was rubber mounted in an isolated cradle to ensure smoothness it was also moved further forward in the chassis frame to maximise passenger & luggage room. One of the Big Six innovations was the fitment of a Luvax fully automatic chassis lubrication system which used engine generated vacuum to supply lubricant to all shackles, steering joints and the steering box from an under-bonnet reservoir – the results were mixed with, predictably, air leaks being a recurring issue. The suspension didn’t break any new ground and followed established Vauxhall practice with semi-elliptic leaf springs front & rear, 6 x 36ins x 1.75ins at the front and 9 x 54ins x 1.75ins for the rear. Vauxhall specification Lovejoy hydraulic single acting shock absorbers were fitted all round. Braking followed suit, standard Vauxhall mechanical operated drums front & rear with the handbrake operating on all four. Steering retained the Cadet’s cam & lever setup but the manufacturer was changed to a patented Marles-Weller helical system with a ratio of 12.6:1 and a 17.5ins steering wheel. A modified, rubber mounted, Vauxhall Cadet rear axle was fitted with a final drive ratio of 5.1:1 for the 20hp and 4.1:1 for the lower revving engine 27hp models. In common with the Light Six, the Lucas electrical system was upgraded from 6 to 12volts but unique to the Big Six was a “Pedomatic” starter, this feature meant to start the car the driver only had to depress the accelerator pedal. Once started the vacuum generated in the inlet manifold was piped to the starter motor to disengage the unit from the flywheel – theory & practice again proved to be two different idioms. Foot operated dipping front headlights, rear stop light and reversing light were all included. Pre-dating The Light Six, the Big Six was first to be fitted with a separate fuse box with all electrics protected by four separate fuses. Styling of the Big Six was an evolution of Vauxhall design themes but, unsurprisingly, showed some General Motors styling cues, namely from the Chevrolet Master Eagle Sedan (CA Series) that was being developed at the same time as the Vauxhall Big Six. Overall, the Big Six was more attractive for the sloping front grille compared to the upright Chevrolet style. Luggage was fully enclosed by a flush mounted boot compartment integral with the rear panel although it wasn’t particularly large for a car of its size. Inside, The Big Six was luxuriously finished with plenty of leather, wood & carpeting in traditional Vauxhall, and British, tradition. The patented no-draught ventilation, Pytchley sliding sunroof, safety glass all round and even a built-in radio aerial in the roof were included. Unfortunately, the centre of attention for the driver was one of the worst instrument panels of any car available at the time, comprehensive it was – stylish it wasn’t, it had all the grace, curves & style of a house brick and looked totally out of place. Vauxhall must have been embarrassed too, in all the Big Six publicity there is not a clear shot of the abomination anywhere to be seen. Vauxhall announced the Big Six in September 1933 ready for the first public showing at the London Motor Show in October. With a starting price of £325 for the 5 Seat Saloon with either the 20hp or 27hp engine the car was a star attraction, it offered a lot of big, roomy & high quality motoring that undercut all rival contenders. As usual there was a raft of Vauxhall approved coach built special body styles to choose from right up to a full 7 Seater Limousine for £550. These specialist body builders, such as Grosvenor etc., were now living on borrowed time as far as Vauxhall was concerned because by the end of the decade there would be none. By the time The Big Six was launched Vauxhall were inundated with orders for The Light Six and it understandable that allocating production capacity at Luton for another model would be problematic but on the face of it Vauxhall appeared to deliberately ignore production of the larger model, of course there were the usual excuses about supply problems, production shortages and all, but did Vauxhall do it deliberately to make a point to Detroit? Evidence suggests that is exactly what they did, it was nearly 12 months before the car became readily available in dealer showrooms but by then the initial momentum and buyer enthusiasm had gone. Apart from the addition of the 7 Seat Newmarket Saloon in 1934 there were no significant changes to The Big Six, nor any significant sales volume either, until September 1935 when a raft of improvements were introduced in time for the October Motor Show and the 1936 model year. The front gained a new design of radiator grille with a body colour painted frame, colour matched front wings, new bonnet louvres and a body coloured metal cover for the spare wheel improved the appearance. A new headlight dipping system was introduced which cut out the offside light & dipped and diverted the nearside beam which, on a dark foggy night in the rain, must have been as scary as a 4am courtesy visit from the Stasi in the DDR. Of more practical use was the introduction of self-cancelling indicators, a crankshaft vibration damper, a thermostatically controlled cooling system, higher gearing on 20hp models with the fitting of a 4.78:1 back axle ratio and an increase in electrical fuses from 4 to 5. 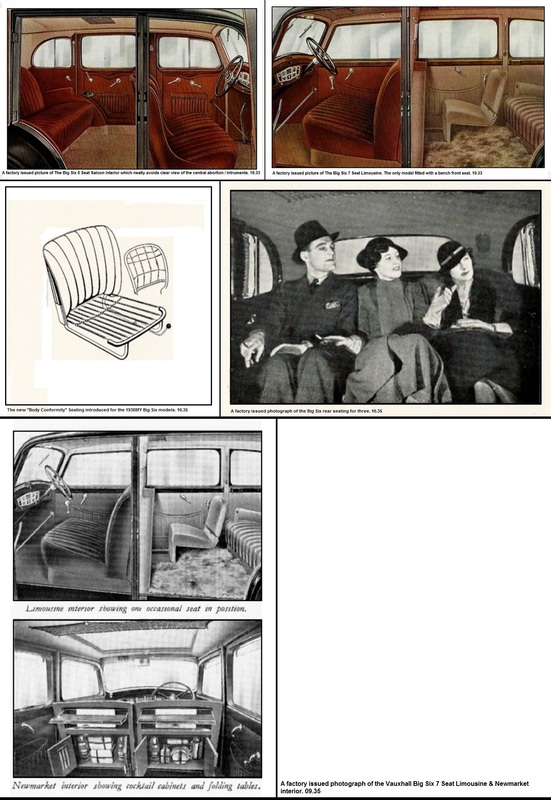 Inside the revised Big Six new front seats were fitted which Vauxhall called “Body Conformity” seating, reports at the time certainly attested to the fact they were very comfortable but Vauxhalls sales department were a little over the top acting as if they had just invented the first ever place to park one’s posterior. There were no further changes until The Big Six ceased production in August 1936. The enigma surrounding the car gets deeper if looked at against the background of what else was happening at Vauxhall, the biggest unanswered question is why it was never offered with independent front suspension like the cheaper Light Six? The Light Six had two major updates during production, The Big Six had one - and not a very comprehensive one either. Could Vauxhall have improved on 4,584 sales in just under 4 years? I think they could - but they wanted to prove a point - that the British Vauxhall Management knew better than any American what British car buyers like & don’t like. I could be wrong!